Now the first thing to do when starting to put together a puzzle is to make sure you have all the pieces to the puzzle. Since our puzzle is about Satan and bible prophecy, we need to collect together all the pieces in the Bible about Satan. If we do a word search for “Satan” then we can see, that Satan is mentioned by name 56 times, in 49 verses in the Bible, using the KJV. Most of these times are instances of Satan mentioned in the 3rd person, often by Jesus, either in the Gospels, or in the Epistles. Then there are a few passages in which we can see Satan doing something in particular in the present, action passages. And then there are even fewer times in which Satan is named and speaks, really only in Job and during the temptation of Jesus Christ in the Gospels. Having done this puzzle before, I can tell you that the passages we need to focus on are passages in which we can derive specific actions or dates out of them, and not so much the passages where Satan is generally mentioned to be working evil. 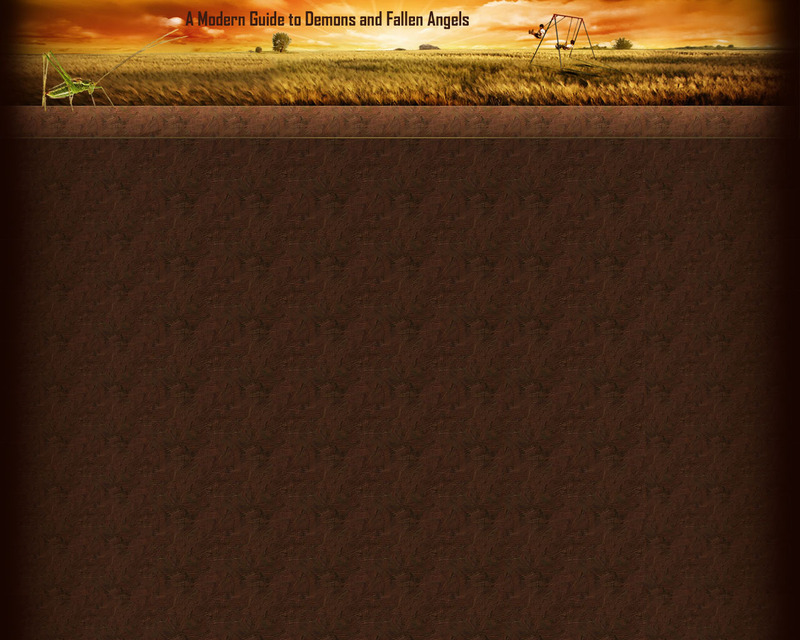 As much of bible prophecy about Satan focuses on key chronological events, we are looking for specifics. In Chronicles he provokes David to take a census, we can date this to circa 1010-970 BC. Then we have the events of Satan and Job, who is thought to be a contemporary of Abraham, circa 1900-1700 BC. Satan is rebuked by the Lord over Joshua the high priest in Zechariah 3, around 520 BC. Then Jesus is tempted by Satan circa 30 AD. Jesus mentions Satan many times as doing things, but as for actual events, there is the temptation, Jesus says he is seeing Satan fall from heaven as lighting, and Satan entering into Judas to betray Jesus. Then spiritual warfare against Satan is presented in the epistles, going up through to Revelation, which also mentions Satan several times. 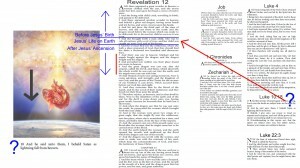 As to key events, Satan is identified as doing things in Revelation 12 and 20, in passages of prophecy. Elsewhere in Revelation Satan the dragon is mentioned in relation to the Beast and end times tribulation events. And so in the Bible, these are the major events in Satan’s history where he is mentioned by name, besides accounting for all the evil the Bible also describes him to do on an ongoing basis. You may notice that Ezekiel 28, Isaiah 14, and Genesis 3 are not on this list. That is because they do not mention Satan by name, and so we cannot prove (yet) that these passages are about Satan. You and I may know they are about Satan, but this series is not about telling you what to think, it’s about teaching you how to think. It’s true these passages are about Satan, but how do you know that? If I mentioned them already, what would prove that they are referring to Satan? You may have been told they are about Satan, taught they are about Satan, and that may be how you know, or it could be the Holy Spirit has told you this. But there is a way to prove this out, and that’s what we are going to get into next. The first thing to note is that we are told Satan is the dragon in Rev 12 and 20, and the terms are used synonymously in Revelation. We are told, it is defined for us, that the dragon is Satan. So we are given the answer to the question, “Who is the dragon”? 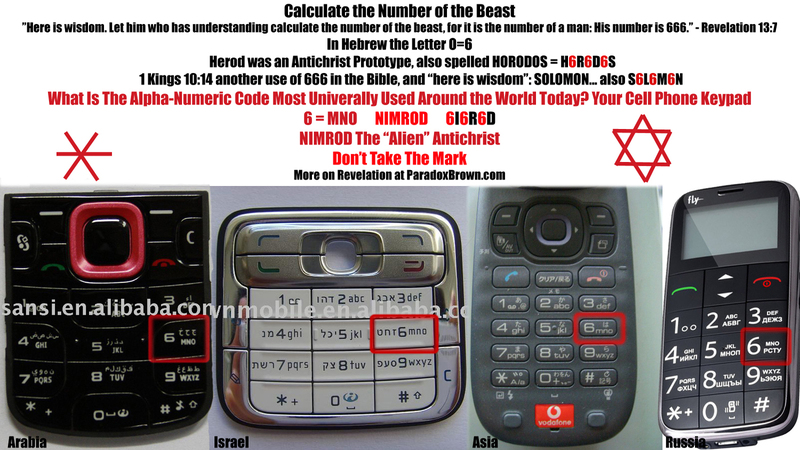 and we know that “the dragon” is a keyword for Satan, and describes Satan. So this is a given. 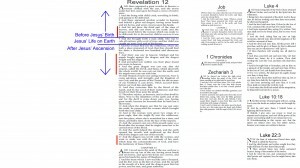 Next, we can look at Revelation 20 and derive that these future events are final events that happen at the end, but the date is hard to determine. Satan will be imprisoned when Jesus comes back, at the beginning of the millennial reign, and released, deceive the nations, and then be cast into the lake of fire, at the end of the millennial reign, but it’s hard to date these things in the future, as they depend on when Jesus Christ returns. So we are going to look at those events as being the final events, and leave them at that. 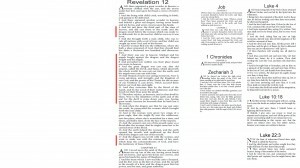 We have dates for many things, but what we don’t have dates for yet are the events in Revelation 12. What events are being described? Are they the dated events we already know about Satan? Do the events of 1) Satan casting down a third of the stars to earth with his tail 2) a war in heaven, Satan cast to earth or 3) Satan battling against the other children of the woman… seem to match the known events we have? Do any of those match the story of Satan and Job? Provoking David to take a census? Satan rebuked by the Lord in Zechariah? The temptation of Jesus? Satan entering Judas before him betraying Jesus? How about Jesus seeing Satan fall from heaven as lightning? Well that might seem to match Satan being cast down to earth after a war in heaven – because we can see Satan going from heaven, down to earth, in the action that is described. The picture of Satan falling from heaven in Luke 10:18 does match the picture of Satan being cast down from heaven to earth in Rev 12. A war is not mentioned, but we do see Satan falling. So let’s make this a hypothesis, which is defined as a “proposed explanation, an assumption or concession made for the sake of argument”. Have we proven anything yet? No. 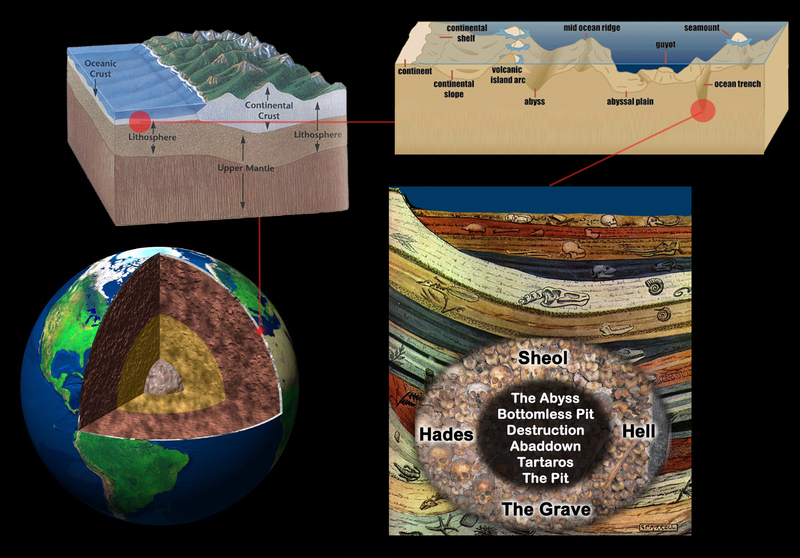 We need something else to verify this hypothesis before it is proven, one element of the picture may match, but we have nothing that proves this. But please note what we are doing, we are matching a picture of Satan falling to earth from heaven, to another picture of Satan falling to earth from heaven. So how would we prove it out? 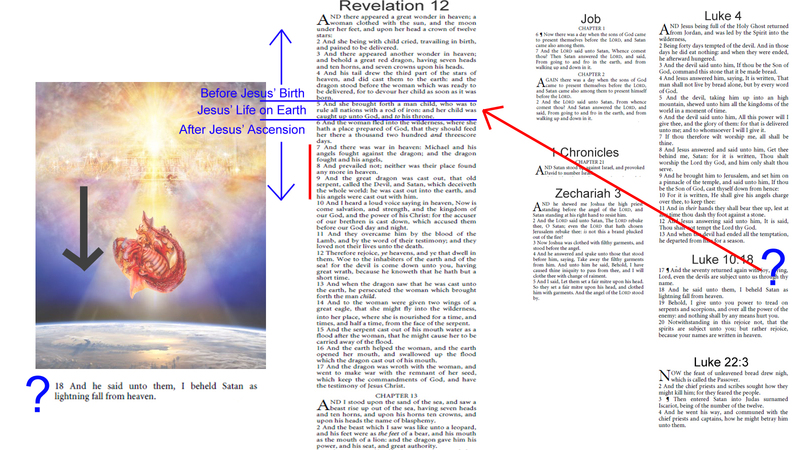 Well, there is more in Revelation 12 than just a picture of Satan falling to earth from heaven. There are other events described before and after this event, with other characters involved, and in an apparent chronological order. 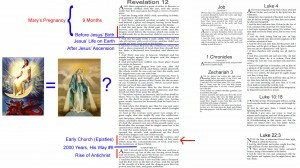 So let’s look in detail at Revelation 12, to see if we can identify what else is being spoken of. 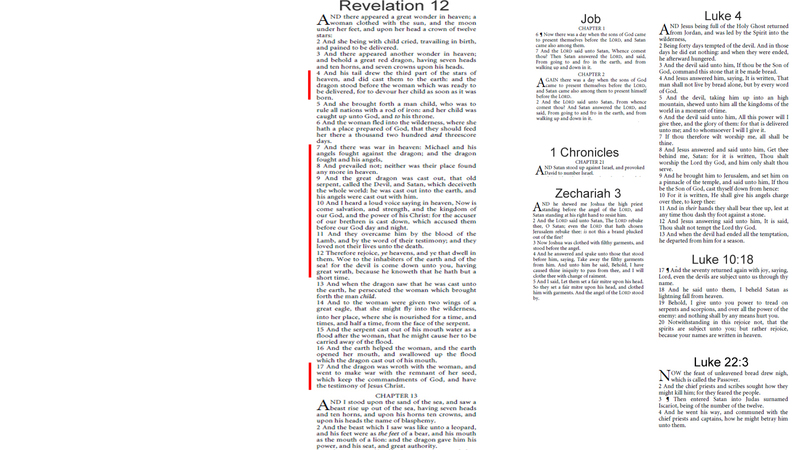 There are 4 characters mentioned in these verses of Rev 12:1-5 – the dragon Satan, the male child, the woman, and God. It would seem knowing who the male child or the woman are might give us clues as to what events are being described here. If we look through Revelation, trying to find keywords, we can see that Revelation 19:15-16 uses the same key phrase “rule with a rod of iron”. Now we know the King of Kings and Lord of Lords is Jesus Christ. 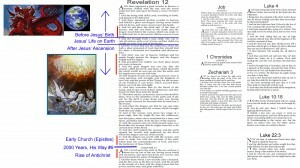 But if you need any further confirmation, Rev 17:14 says the Lamb is King of Kings and Lord of Lords, and Jesus is mentioned in 22 verses as the lamb in the book of Revelation, giving contextual clues that show it must be Jesus who is being spoken of, but also John 1:26 and 29 further define Jesus to be the Lamb of God, as John the Baptist calls Him to be. So there is proof that Jesus Christ is the Lamb of God, internally consistent and verified in the Bible. The Lamb is King of kings and Lord of lords, and He is who will rule the nations with a rod of iron, and it is the male child in Rev 12 that will rule the nations with a rod of iron. 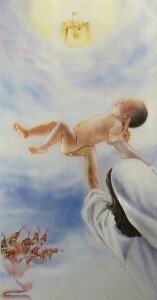 So as such, we can absolutely know for sure that Jesus Christ is the male child in Rev 12:5. Looking at Rev 12:5, what we are told is a very brief summary, the child is born, he is to rule all nations with a rod of iron, and then he is caught up to God and His throne. So what we are told is Jesus is born, then He is caught up to God and His throne. Jesus Christ’s entire life on earth, seems to be summarized in this way. We know that after His crucifixion and resurrection Jesus Christ ascended into heaven, to God’s throne ( as is told in Act 1:9-11, Mark 16:19, Luke 24:51). From this we can know that everything that happened before the woman gave birth happened chronologically before Jesus Christ was born, and everything that happened after the male child was caught up to God’s Throne happened after Jesus ascended into Heaven to God’s throne. We don’t need to know who the woman is in order to know this, because it rests upon Jesus Christ being born, marking the beginning of his first coming, and when He ascended to God’s throne, marking the end of His first coming on Earth. Focusing back in on Satan, this means that he swept down a third of the stars of the sky to the earth with his tail Before Jesus was born. And also, this means that the war in heaven and Satan being cast down to Earth came After Jesus Christ ascended into Heaven. 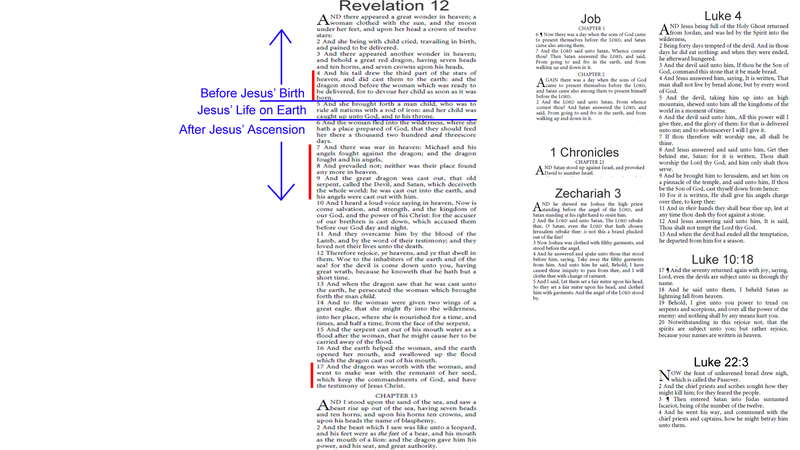 Jesus Christ’s birth, entire life, and ascension is summarized in verse 5, so now we have a chronological marker, an event, by which to organize and understand the rest of the story. 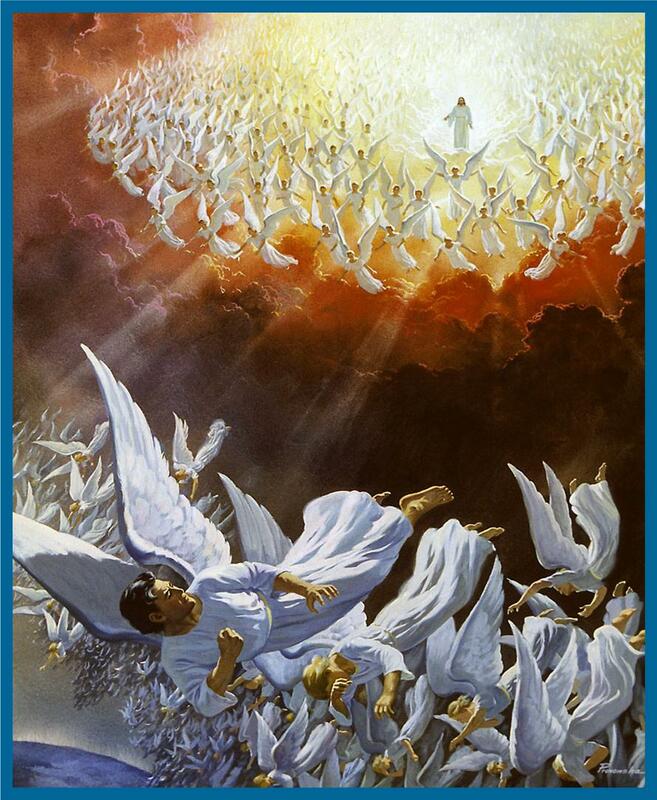 Looking at what comes next, after Jesus Christ ascended to Heaven, it is after Jesus Christ ascends into heaven, that the war happens in heaven, and Satan is cast down to Earth. Then Satan persecutes the woman, and the rest of her children, who have the testimony of Jesus Christ. Again, we don’t need to know who the woman is, or understand the rest of these events in this passage, in order to understand the simple fact that verse 5 starts with Jesus Christ’s birth, and ends with His ascension. That gives us a marker to discern that the passage can be divided correctly into before Jesus’ birth, and after His ascension. So don’t be troubled about the rest of the passage right now, let’s focus on what we can prove out and do know. So going back to our hypothesis, could Luke 10:18 be referring to when Satan was cast to earth out of heaven, after the war in heaven? Is there a reason why this cannot be the case? Well the war in heaven comes after Jesus Christ’s ascension, and Luke 10:18 occurred during Jesus’ life, which would be during verse 5 here in Revelation 12. 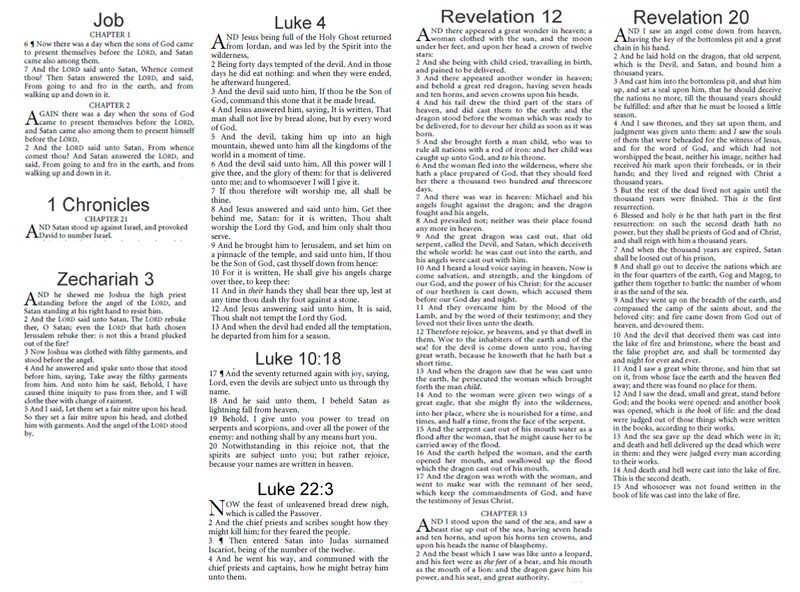 So Luke 10:18 lines up to verse 5, and the war in heaven and Satan being cast down to earth comes in verse 7-8. Which means that No, Luke 10:18 cannot be referring to when the war in heaven took place and Satan was cast out of heaven down to earth, because it is too soon in the passage for those events to fit correctly in verse 5. We have a provable chronological order here that is essential in understanding where what fits correctly. And so while the picture, visual imagery and actions, of Luke 10:18 and Rev 7-8 do match, the timing is incorrect, Luke 10:18 is during Jesus life which is summed up in verse 5, and the ascension of Jesus in verse 5 precedes the war and Satan being cast down in verses 7-8, and so we have disproved our original hypothesis. 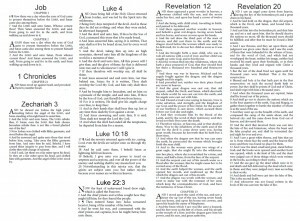 However, this is not a total loss, because in disproving this hypothesis, we also can learn something positive from Luke 10:18 – which is that Satan was in heaven and went down to earth while Jesus was here on earth, but that Satan must have Also been in heaven after Jesus Christ ascended, in order for the war in heaven which followed to have taken place. This means that we can learn from Luke 10:18 that Satan was able to go back and forth to Heaven at times, during Jesus’ life, and in general, prior to the war in heaven. However Rev 12 described that after Satan was cast down to earth, place was found no more for Satan in heaven, and so we can see after this point Satan and his angels were banned from Heaven and around God’s throne. He is called the “accuser” of the brethren, who accused them day and night, and so he is not able to accuse the brethren before God after he is cast down to earth, after the war in heaven, after Jesus Christ’s ascension. So looking at the rest of Rev 12 in context, Satan is said to make war against those who have the testimony of Jesus Christ, or Christians. This would match up with the spiritual warfare described in the epistles of the New Testament. Going to Chapter 13, we can read “And the dragon stood on the sand of the seashore. Then I saw a beast coming up out of the sea…” and so it seems that Satan is waiting for the beast from the sea, the antichrist. We know this is an end times event, the rise of the Antichrist. Satan goes to make war against the other children of the woman, who have the testimony of Jesus Christ, Christians, in the final verse of Rev 12:17, which is affirmed in the early church epistles. But in the next verse of 13:1 some 2000 years must have passed, because then the Antichrist beast is rising out of the sea. This is His Way #6, the patience of God, that sometimes there is a long gap between 2 verses, which can be deduced from context. 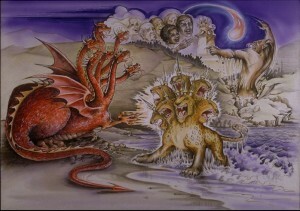 The epistles confirm the persecution of early Christians by Satan, as is mentioned in Rev 12:17, but Rev 13:1 describes an event some 2000 years later, as we can know both from recorded history, in that these events have not been fulfilled yet, but also as seen in the picture here that Satan is waiting by the seashore, for the beast, which parallels 2 Thessalonians picture that the coming of the Antichrist is in accordance with the working of Satan, so that people may believe the strong delusion and the lie when the Antichrist arises. We see Satan on the seashore, waiting for the beast, in such a way in Rev 13:1, and 2 Thessalonians fill in more detail on Satan anticipating his arrival. 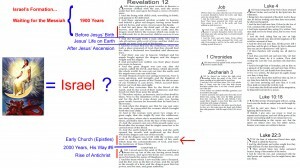 But going back to earlier in Rev 12, also on Satan, we can see that he was prepared to devour Jesus as soon as he was born, which could likely reference to both Herod’s killing of the children in Bethlehem, but also due to the briefness of Jesus’ life as summarized in verse 5, this could refer to Jesus being crucified, and the hand Satan played in that through Judas’ betrayal. Satan tried to devour Jesus in Bethlehem and failed, and tried to kill Jesus with the crucifixion, working through Judas and his betrayal, but ultimately failed in this also as Jesus Christ rose back to life after 3 days, then later ascended to God. But in this we actually have our first match, from our list of known events in which Satan was named, in that Satan tried to devour Jesus, to destroy him, through His life – and so we can match the betrayal of Judas as fitting chronologically into verse 5, and the intent of the action of devouring as it’s mentioned at the end of verse 6. Working backwards chronologically, prior to Jesus birth we can see Satan cast down a third of the stars to earth, but we don’t know what that is or when it happened. The passage begins with a woman who is in labor. In order to follow the chronology, we need to understand who the woman is, because the passage begins with her. While she is in labor, Satan casts down a third of the stars with his tail. So depending on what this means, we can have very different timetables for what this event is of the stars being cast down by Satan’s tail. Who is the woman? Mary gave birth to Jesus, so is she Mary? She could be Mary, in that she gave birth to Jesus. If this is the case, then Satan must have swept down a third of the stars to earth with his tail (whatever that means) after Mary got pregnant with Jesus, but before giving birth to Jesus, during that 9 month period of Mary’s pregnancy. But we are told the rest of the children of the woman are those who keep the commandments of God, and have the testimony of Jesus Christ, aka Christians, and Mary did not literally give birth to all Christians, so we can know that the woman represented here cannot be Mary. She is depicted in a celestial scene, and has 12 stars around her head, which would also tend to indicate this is symbolic and not literally Mary, or just Mary, Jesus’ mother. So there is a riddle here. Who has given birth to all Christians? There are 12 tribes of Israel, who as a nation is often referred to as female, and 12 stars around her head. Jesus the Messiah, the Christ, was born through Israel, and given as a light to the Gentiles and Jews. The distinction made between the phrases “keep the commandments of God” and “have the testimony of Jesus Christ” in verse 17 could be taken to show a partial dichotomy, Jew and Gentile, and refer to Jews who follow God’s commandments, who became Christian, as well as Gentiles who have the testimony of Jesus Christ also. In which case it seems possible that this woman is representing Israel. So this is our next hypothesis. Does the woman represent Israel? If so then this means that sometime after Israel existed, while Israel was “pregnant” waiting for the Messiah, that Satan swept down a third of the stars from the sky with his tail. Israel as 12 tribes began loosely around 1900 BC. If this is the case then it means that Satan cast a third of the stars down to earth with his tail after the start of Israel, 1900 BC, and before Jesus Christ was born. 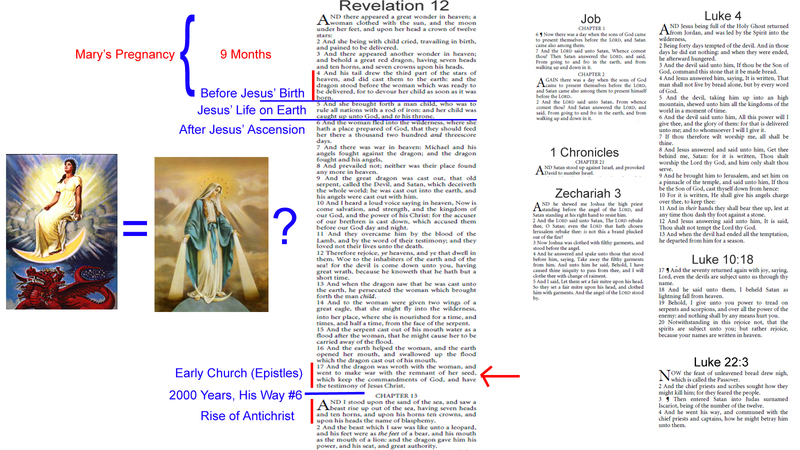 So instead of this event taking place during 9 months of Mary’s pregnancy, had she been the woman, if the woman is Israel then this event could have taken place anywhere between about 1900 BC up to when Jesus Christ was born, or over a stretch of time lasting some 1900 years. This is allowable as the woman is pregnant over a stretch of time, even 1900 years of pregnancy, which is summed up in 4 verses. This hypothesis seems to make sense, and there are a couple reasons why it makes sense, and nothing to disprove it as of yet. When we know what the stars cast down with Satan’s tail are, we would have either another confirmation, or will receive a negation of this hypothesis. What the stars are that Satan casts down to earth with his tail will need to match the hypothesis that the woman is Israel, and make sense, to prove this hypothesis any further. But since we don’t know what the stars are yet, let’s let this part alone until we get more information, to show one way or the other. Is there anything else in this passage that would help to explain what the stars are that Satan casts down to earth with his tail? Is there something that goes with him where he goes, where we see a similar action or picture described? Revelation 12:9 says that Satan has angels that are cast out of heaven with him, later on. Could these be the stars that, earlier on, were swept down to earth with Satan’s tail? Remember, it is important to keep in mind that these are 2 separate events being spoken of here, which are placed chronologically, 1 before Jesus birth, and 1 after Jesus’ ascension. Satan sweeping down the stars with his tail, and the war in heaven are two separate events, one before verse 5 that divides the passage, and one after verse 5. 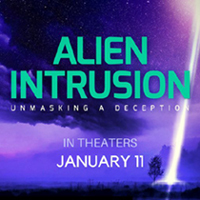 The action of something going down to earth with Satan may look similar, but these are clearly 2 separate events, and we don’t know what the first event is, where Satan’s tail casts down a third of the stars, an event which comes before Jesus Christ’s birth. So here we see that “stars” are symbolic for “angels”. So it would make some sense that the stars swept down to earth by Satan’s tail are angels, and these could be the same as Satan’s angels who are mentioned to be cast down to earth with Satan later, after the war in heaven. But here is a separate event that occurs prior. So now we have a hypothesis that the stars cast down by Satan’s tail, prior to the birth of Jesus, are perhaps the same fallen angels who later are cast down to Earth with Satan, and banned from heaven, after the war in heaven, which happened after Jesus Christ ascended. Yet, this first event is a separate event, than the second post war in heaven, event. And we don’t know what is being spoken of here. So let’s pause here a minute. And just a note, the reason we looked for the symbolism about stars there, and not earlier with the stars around the woman’s head, is because the clue given about the woman was an emphasis of 12 stars, and other clues about her identity were given also. So we went with the most obvious clues. But in this case there were no obvious clues, so we went digging. There’s a difference between a precise 12 stars around the head of a pregnant woman, and a third of the stars of the sky involving Satan. 12 angels around the head of woman isn’t going to help solve this puzzle, so it would seem to not be the correct way to go. We pursued the clues in the puzzle that make sense, and don’t pursue the dead ends that don’t make sense, so they don’t go anywhere. What have we been doing? We have been trying to decipher riddles based on matching pictures or actions of events, cross-referencing scriptures that define symbolic imagery, and using logic to derive information about what particular passages may mean. We have been solving a puzzle, like you would want to solve a puzzle or riddle of any other sort. We have been deciphering using logic, what passages must indicate. From this we derive a hypothesis, like seeing if 2 jigsaw pieces fit together. But to test the hypothesis, we must see if all the pieces around those 2 also fit correctly. If they do not fit correctly, then we can know the hypothesis was wrong. Or if the visuals do not match, of the pictures or actions, the visual imagery of what is described, then we know they don’t match, and don’t examine a correlation in the first place. Why connect a puzzle piece of an eyeball to a foot? 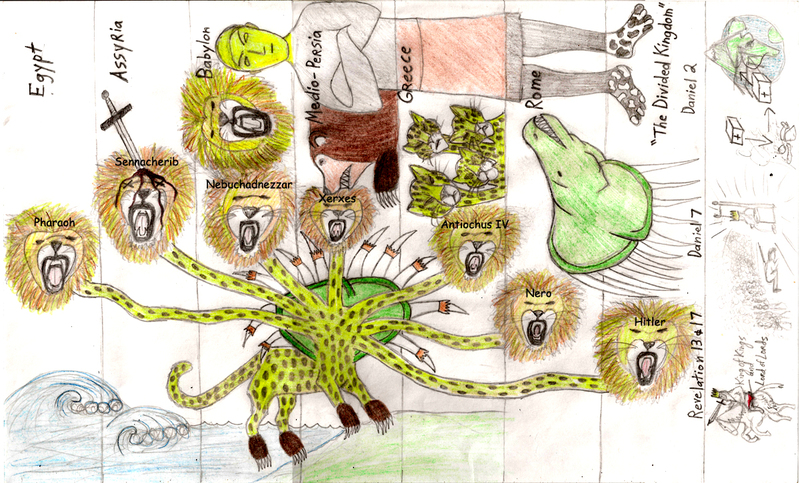 So when the visuals of the what is depicted matches, we start there, just like a kid’s matching puzzle. But if they don’t look similar, then we aren’t examining them, also just like a kid’s matching puzzle. We haven’t tried to force a comparison between David’s being provoked by Satan to take a census, with “Satan swept a third of the stars of the sky down to earth with his tail”. Why? Because there is no obvious match, and we aren’t trying to force 2 pieces that don’t match together. On the other hand, we did examine Satan falling from heaven as lightning with Satan being cast to earth from heaven, because there is a similarity in what is depicted. So we are matching, and looking at the rest of the Bible to figure out what symbolism might mean, using our knowledge of the rest of the Bible and history, to determine what may likely be referenced. Then if we can find verification elsewhere in scripture, like Jesus Christ being the male child who will rule all nations with a rod of iron, and his birth and ascension, we can test or prove out the hypothesis. But when something disproves a hypothesis, we disregard the hypothesis. When we don’t know, for lack of proof or missing pieces of the puzzle, we admit that we don’t know, and pause on that until we can find more information to verify the hypothesis. Rather than deciding a matter without proof or verification, in other words knowing what we are talking about and seeing all the pieces fit together, and rather than making something up, we are handling this logically. Until all the pieces fit, we do not have the final answer. We are working out a puzzle, and no one says they have completed a puzzle until all of the pieces fit. Because it is a puzzle, we can know that if pieces match visually, and in meaning, and the Bible verifies them, then we have the answer. We do not have to stick to guesses, or even just make something up, because when we get the puzzled solved we will have a definite answer, because all the pieces will fit, because when you are working a puzzle, all the pieces were designed to fit. From looking at it this way, we can also easily see that the temptation of Jesus falls under Rev 12:5, as does Satan entering into Judas, and Satan falling from heaven as lighting. We seem to have made a lot of progress. (Yay!) But we also seem to have reached an impasse. What else can we do with this passage? Nothing is jumping out. Are there any clues given that might give more information? What are we looking for, what pieces of this jigsaw do we still need? 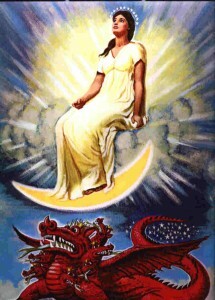 We need to understand who the stars are that Satan swept down with his tail, and what this is referring to, in order to test our hypotheses that the woman is Israel, and the stars are the angels, perhaps as later mentioned as Satan’s angels that were cast down with Satan during the war in heaven. 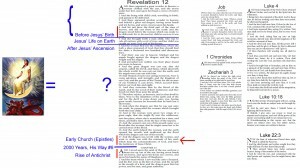 Looking at our reorganized chronology, the passage in Zech and the one in Chronicles do not seem to fit one third of the stars of the sky being swept down by Satan’s tail, as numerous angels are not mentioned, however the passage in Job does mention numerous angels, the “sons of God” – but there is no picture of them being swept down to earth in any way by Satan’s tail. Nevertheless, this is our closest match, and Rev 12:1-4 as a time period does seem to point to the Old Testament, and if there is something missing in the story of the Satan, it would seem to be found in the Old Testament time period. Is there anything else in Rev 12 that might be a clue? Is there anything tying to the Old Testament? In Rev 12:9 Satan is “that old serpent”, or in other translation “that serpent of old” or “ancient serpent”. Let’s pretend we don’t know what that means, and try to figure out why Satan is called the “serpent of old”? Doing a word search in the Old Testament, the word “serpent” is used in 27 verses in the KJV. Could Satan be the staff of Moses that turned into a serpent, and ate the Egyptian magicians staffs that also turned into serpents? No… How about the brass serpent on a pole, that when Moses held it up, those who had been bitten by serpents were healed? Oh, heck no. In both cases these serpents are symbolic of God and good, and in the last case the serpent lifted up on a pole is symbolic of Jesus Christ taking our sins upon Himself on the cross, so that we would be forgiven and healed of our sins, like healing the poison of a snake bite. So that’s way off. Leaving aside incidentals of usage, looking at major serpent stories in the OT, we are left with Genesis 3, so let’s look there. 3 Now the serpent was more crafty than any beast of the field which the Lord God had made. And he said to the woman, “Indeed, has God said, ‘You shall not eat from [a]any tree of the garden’?” 2 The woman said to the serpent, “From the fruit of the trees of the garden we may eat; 3 but from the fruit of the tree which is in the middle of the garden, God has said, ‘You shall not eat from it or touch it, or you will die.’” 4 The serpent said to the woman, “You surely will not die! 5 For God knows that in the day you eat from it your eyes will be opened, and you will be like God, knowing good and evil.” 6 When the woman saw that the tree was good for food, and that it was a delight to the eyes, and that the tree was desirable to make one wise, she took from its fruit and ate; and she gave also to her husband with her, and he ate. 7 Then the eyes of both of them were opened, and they knew that they were naked; and they sewed fig leaves together and made themselves loin coverings. So looking at Gen 3, we can see several very interesting things. First, the serpent here talks, which is weird, which might indicate there’s something different about this serpent than normal snakes. We are in Gen 3, so this is definitely an old or ancient time, which would match this being a serpent of old. This serpent deceives Eve, and in Revelation 12:9 Satan is said to deceive the whole world. And we also have a “seed” of the woman mentioned here, that will bruise the serpent on the head. So a woman having a child is mentioned, and her child will crush the head of the serpent, as in other translations. We can see that the serpent also fights her seed, but only bruises His heel, so ultimately as the head is more essential than the heel, while the serpent delivers a minor blow, the seed of the woman delivers a major and crushing blow. Looking ahead to Rev 20, we can see that Jesus Christ defeats Satan, as Satan is thrown into a lake of fire, and we know the male child born in Rev 12 is Jesus, so it would seem to match here that the child, or “seed” of the woman in Rev 12 defeats Satan, the serpent of old. So we have 3 things here that would indicate this serpent in Gen 3 is Satan, that Jesus Christ is the child or “seed” born of the woman in Rev 12, that Jesus defeats Satan or the serpent of old, and that this serpent deceives Eve, and the ancient serpent in Rev 12 deceives the whole world. 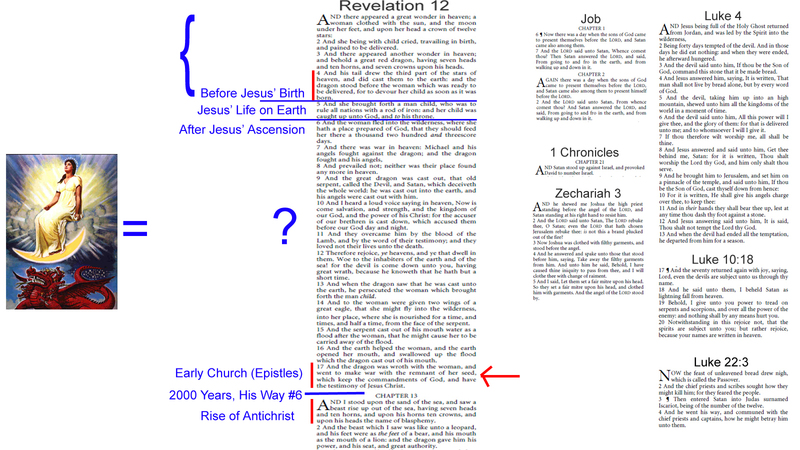 It’s seems that Satan in Rev 12 matches the ancient serpent in Genesis 3. Well, that’s nice, now we have the beginning of the story. Prior, we had much after 1900 BC, the end of the story, of Satan burning in the lake of fire, but we did not have the beginning of the story of Satan. Now we also have added a beginning to the story of Satan, going back to around 4000 BC in Eden, right after the beginning of Creation. However, we seem to be no closer to understanding how Satan swept down a third of the stars with his tail in the OT, and seem to have only gained a new question about the woman. Is the woman Israel, or is the woman Eve? It would seem now that in some ways she might be both. Which raises the question of if she has to be one or the other, or if she might be Israel in ways, Eve in ways, and stepping backwards, if that is allowed, then perhaps even Mary in ways. We do not seem to have a full picture yet, and still the closest story in the OT to Rev 12:1-4 and Satan sweeping down a third of the stars of the sky, seems to be the “sons of God” in Job, but this picture does not match either. Now, if you are already familiar with the “Divine Council”, as taught by Dr. Michael Heiser, you are probably straining at the bit, thinking that must be related, and waiting for the connection to be made. However, most people have still not yet heard of the Divine Council and Dr. Heiser’s work on this. So almost to highlight just how extremely important it is, we are going to try to continue on in this study without it for a while, and see just how far we can get without going straight to Dr. Heiser’s research on this topic. But invariably, when you are stuck, as we seem to be, the answer would be to study the Bible. If you have not studied the Bible, then you probably are going to get stuck right at this point, because there seem to be few leads left to go on. If you have not read the entire Bible, then there’s nothing that is probably coming to mind at this point. Well, of course you’ve been told that Ezekiel 28 and Isaiah 14 are about Satan, but nothing so far has proven that out or even pointed there from where we have gone.